The picture above is exactly what I bought this morning on my way from the subway to work. No, I haven’t eaten that stuff yet. The nasi lemak and its accomplice, the otak-otak (or otah as known in Singapore), are sitting next to me on a pedestal drawer. I can practically hear them calling out to me ‘Eat me! Eat me!’…trying to seduce me with their heavenly aroma (or fishy smell to be exact!). The smell of the banana leaves is also very enticing, so now you know why I like my rice to be wrapped in banana leaves. 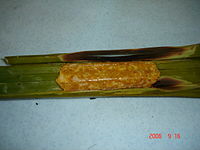 Anyway, I’ve already introduced my good friend the Nasi Lemak, let me introduce the Otak-otak. According to Wikipedia, its name isn’t very enticing I’m afraid: The word otak-otak came from the old Sanskrit word which means flour…Otak means brains in Indonesian and Malay, and the name of the dish is derived from the idea that the dish somewhat resembles brains, being grey, soft and almost squishy. Yup, soft and squishy is right, though it’s mostly orange-y colour unless it’s non-spicy. It is a mix of fish paste (usually mackerel) and spices. It smells fishy (DUH!) but really good ones are soft and you can taste the fish meat. 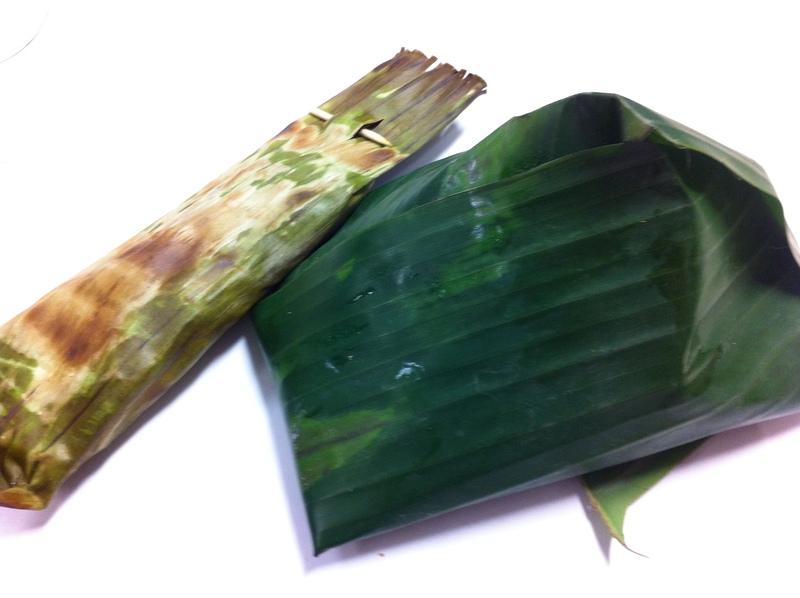 It is wrapped in banana leaf and steamed or grilled over charcoal fire. Usually over here it is grilled. It’s a dish commonly found in Malaysia, Indonesia and Singapore, just like its friend the Nasi Lemak. According to Wiki again, this dish is similar to the Polish’s Paprykarz szczeciński.